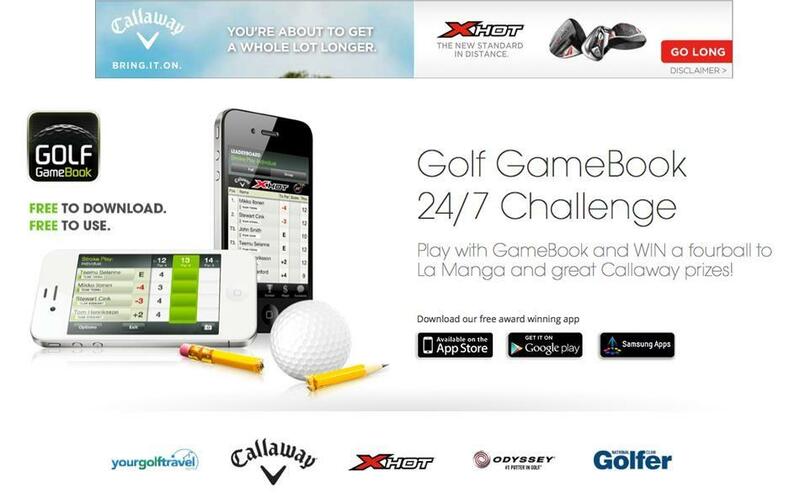 Golf GameBook 24/7 Challenge UK – The Biggest Ever Golf Contest for British Golfers! Great news for British golfers! In close cooperation with Callaway Golf Europe, Your Golf Travel and National Club Golfer Magazine, Golf GameBook introduced “GameBook 24/7 Challenge UK“, which is 10-week-long & free-to-enter golf tournament for every British golfers! So we can rightly say that this is the biggest golf contest ever organized in UK! Partnering with equipment giant Callaway Golf and holiday specialist Your Golf Travel, prizes couldn’t get better! Your Golf Travel provides the grand prize, which is 4-ball at La Manga Golf Resort in Murcia, Spain. And Callaway is rewarding UK golfers with X hot drivers, Odyssey Versa Putters and HEX Black Tour Balls in every two weeks! Pretty cool, don’t you think? For those who are not familiar with rules yet, this is how it works: All you basically have to do is download a free Golf GameBook app and play full round (18 holes) of golf and keep your score with GameBook app – and you’re in! The more you play, the better chances of winning! The winners of the bi-weekly competitions won’t be simply judged on the best scores. Golf GameBook has devised a ‘secret’ prize structure that will change from week-to-week, and could award on the most birdies in a round, most holes played to par, even putts per round. Nowadays GameBook has most of the world’s golf courses in its database. In case some specific golf course is missing, players always have the option to create it there yourself – with app or on our online service. But of course that’s not necessity – we can do it as well! If you’ll face such a situation that the golf course is missing, please send us feedback from the app (under “profile” tab), tweet the information, write to our Facebook wall or contact us by email and we’ll create it right away!